The new Solo 2 receives data from two satellite constellations, GPS and Glonass; this is a huge step forward since it is unbelievably faster and more precise than the previous version. The power-on requires only a few seconds and the lap times are calculated with a max 2/100 sec of tolerance. A sleek new case with easier-to-use metal buttons give the new SOLO 2 a premium look and feel. Solo 2 has access to a database of more than 3,000 tracks all over the world! As soon as it switches on, the Solo 2 identifies its position, recognizes the starting line coordinates of the track, and is ready to start sampling lap times. If your track isn't in the database, no problem: the Solo 2 will automatically enter into autolearning mode, figures out the characteristics of the track, and starts lap-timing anyway. 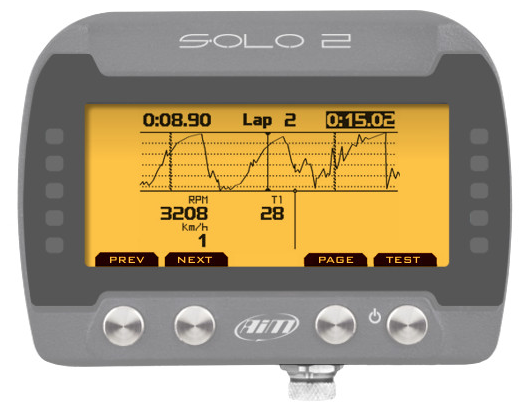 The new Solo 2's predictive lap time engine is now even more reliable. And with configurable RGB LEDs, it will give you a clear, fast indication of how your current lap compares with your best possible lap. That's functionality you typically find only on expensive driver-coaching electronic aids -- now it's at your fingertips with the Solo 2! In each of these configurations, Solo 2 gives the relevant information during the race/test along with powerful data review immediately after each session. At the end of your session or race, you can quickly review key lap information right on the Solo 2 color TFT display. WiFi communication with your laptop is easy, fast, and with no connectors or cables. It's the best way to configure your Solo 2, manage the track database, and download lap data to your PC. Connect your Solo 2 to your iPhone for a quick and comfortable data analysis, managing your track database, etc. Feel free to give us a call at 844-438-7244 to discuss the cool new features and capabilities of AiM's latest, greatest compact lap timer today!